New Voices for Research: Start Up Your Ingen--uity!! Have you ever wondered how some big companies got their start? We may have heard the amazing stories of people who failed many times, but kept their dream alive to eventually hit pay dirt. Even in National Institutes of Health (NIH)-funded medical research, this is the story line of most, if not all, of the major scientific achievements that advance to the marketplace. A good business-minded researcher must have the ability to see what is not already there, and the imagination and work ethic to fill that need. They also have to be persistent through the many failures they will endure. This makes bioscience a risky, but high potential investment and that’s where the NIH comes to assist with its Small Business Innovation Research (SBIR) grants. Over the years, the NIH’s SBIR program has been successful in expanding new bioscience companies. One success story of the SBIR program is LigoCyte Pharmaceuticals in Bozeman, Montana. LigoCyte’s goal was to develop a new type of drug to treat chronic inflammatory diseases of the lung such as asthma. 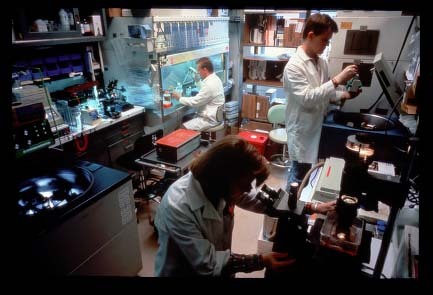 An NIH SBIR grant in 1999 allowed the company to carry out its project and it produced a drug that could block immune cells from binding to blood vessel walls, which is a key event in inflammation. With federal support, LigoCyte found the drug was effective and continued to carry out their research. Since asthma affects more than 17 million people in the U.S., a drug like this has the potential to improve many lives. Inflammation is also involved in other maladies like psoriasis and heart disease, so LigoCyte will likely expand its focus for this product. Ligocyte with more than 40 employees continues its research efforts in chronic inflammatory disease, although it is now focusing similar drug strategies on vaccines for influenza and norovirus (the stomach flu) due to exciting results in those areas. That demonstrates how fast science can evolve from one idea. All you need is a start, and the NIH SBIR program gave them the push. If you think NIH funding is important to “kick-start” small bioscience companies, let your representatives in Congress know! Inspiring! I've always believed biotech was the future of this country.